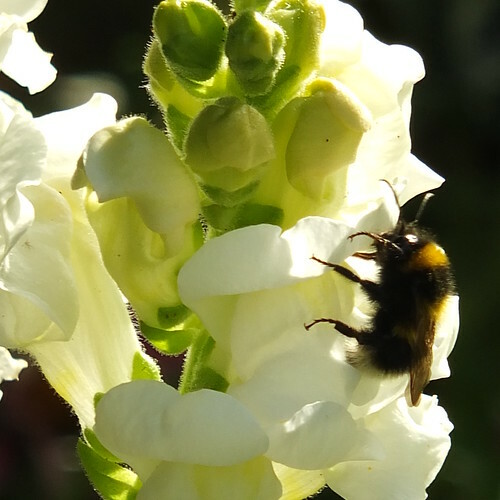 Bumble bee on snapdragon_0001.jpg, a photo by Patricia Manhire on Flickr. My photo of the day. I have been exploring my camera and started using the A setting on the camera and discovered the optical digital zoom which gave me a lot more grunt for macro photography. Here I managed to get a brief ray of sunshine to back light the flower and because I was able to zoom in I got a much better bokeh effect without manipulating the environment. I am looking forward to learning more about macro photography at the camera club. But sometimes there is nothing better than getting out and practicing. At least with digital cameras you can view the photos and delete them as necessary before printing them off. I would also like to add that my Memory Manager 4.0 has been an excellent tool to help me sort all my photos easily and I do all my editing and journalling in it before I upload to Flickr. It is so much easier doing this than doing it online. Plus I can also rate my photos as well so I know which ones to use when I am doing my digital and/or traditional scrapbooking. MM also has a feature where you can put the photos into an album to help you plan for doing an album which is great for oganizing in advance. I have started to also use more touch up tools as well, but that is also a work in progress and another topic for a future post.